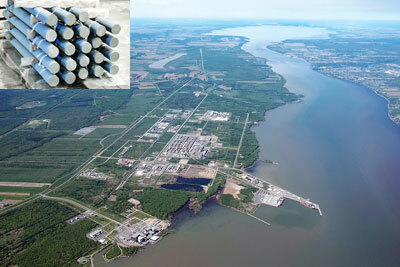 The clean hydropower available at Bécancour Industrial Park helped lure REC to choose the site for the manufacture of polysilicon (inset) for the solar and semiconductor industries. fter looking for 17 months among more than 100 sites in 16 countries, Norway-based REC Silicon in August chose Bécancour, Québec, just outside Montréal, for a US$1.2-billion polysilicon plant that will employ more than 1,000 people. Beginning in 2012, the plant will start producing material to make semiconductors and solar panels, developing the plant in stages, with the possibility of four total production units, each similar in size to the company's new plant in Moses Lake, Wash. Important to the deal was an offer from the province's department of energy of up to 95 MW of power for 20 years at a rate established for large power users. The agreement with Hydro Québec also meant the company was assured of its preference to power its plants with electricity from non-carbon-based sources. Also important were the availability of raw materials and solid industrial infrastructure at the Bécancour Waterfront Industrial Park. Emploi-Québec is also offering REC Silicon a C$4-million non-refundable contribution, equivalent to 25 percent of training costs, for a period of three years. The team eventually whittled its list to nearly 40 sites that received due diligence, then just a handful with which REC conducted direct negotiations. REC officials were not made available to respond to questions about the project. "We are pleased to select Bécancour as the preferred site for future silicon materials expansions," said REC Silicon's President and CEO Gøran Bye at the project announcement. "During the site selection and negotiation process, the Government of Québec, particularly Investissement Québec, has proven to be welcoming and encouraging. We also see great potential in the work force and complimentary industries in the area." Over the years the park has attracted over $3 billion in plant investment in the electrometallurgy and electrochemistry sectors, including facilities from Alcoa and ARKEMA. Among its most recent projects was the January 2008 announcement of a C$153-million, 80-job canola seed and soybean crushing plant from Quebecois firm ETGO, which had also considered the U.S. Pacific Northwest. The move comes on the heels of a cost overrun at the firm's nearly completed polysilicon foundry in Moses Lake, Wash. REC and Fluor are working together on that project, which has seen its cost estimate balloon from $660 million to $800 million. In a February 2008 release detailing the problems, Bye said, "We are confident that the fluidized bed reactor technology will enable us to maintain and fortify our position as a cost leader in the production of polysilicon for the solar industry. However, the global market for engineering, construction, equipment, and installation is very tight, and the related consequences have been underestimated. We are very unhappy with this development, and together with Fluor Corp. we are now taking measures to focus on completing the project and minimize the negative consequences for REC." REC President and CEO Erik Thorsen said, "During the last 12 months, REC Silicon has strengthened the project organization to count around 50 people, and a project office has been established in Houston, Texas, to execute future REC Silicon projects. This will reduce our dependency on external project management contractors. Recently, REC has also started to build a new corporate project organization to enable best practices in project management across all REC expansion projects." There are significant other expansion projects: In June, REC said it would invest $64 million in expanding its Herøya manufacturing complex in Norway, and $2.2 billion in the first phase of an integrated manufacturing complex for production of wafers, cells and modules in Tuas View, in the western part of Singapore, where REC has a 30-year lease with landowner Jurong Town Corp. There too, REC has been very focused on re-engineering its pre-engineering, having allocated "75 man-years" to such planning in order to optimize the layout.REC expects to conclude pre-engineering for the new Québec plant in six months, at which time a decision on its final size will be made. Construction is anticipated to start in 2010 with Phase I production capacity available in 2012. At the August announcement, Julie Boulet, Québec Minister of Transport, Minister of Natural Resources and Wildlife and Minister responsible for the Mauricie region, suggested that the province wants to do more with solar energy. "Our plan is not to simply enter the solar panel industry," she said. "We also want to take advantage of solar energy to satisfy our own energy needs. For this reason, the Québec government will announce this fall a strategy designed to foster solar energy production." n late September, Washington, D.C.-based high-tech research organization AeA released its Trade in the Cyberstates 2008 report, which listed the leading states for high-tech exports in 2007, noted in yellow on the map above. 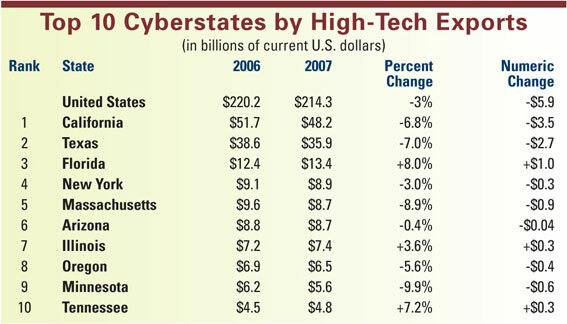 Twenty-nine states saw tech export growth between 2006 and 2007. The largest growth was in Virginia, Florida, Idaho, New Jersey, and Utah, as measured by dollar increase. AeA noted that high-tech exports, totaling US$214 billion in 2007, represented 18 percent of all U.S. exports to the world, but trailed U.S. high-tech imports in value by $118 billion. In early October, the National Science Foundation revealed further measures that may help close that gap, as it announced the establishment of five new NSF Engineering Research Centers (ERCs) for the development of interdisciplinary research and education programs in partnership with industry. 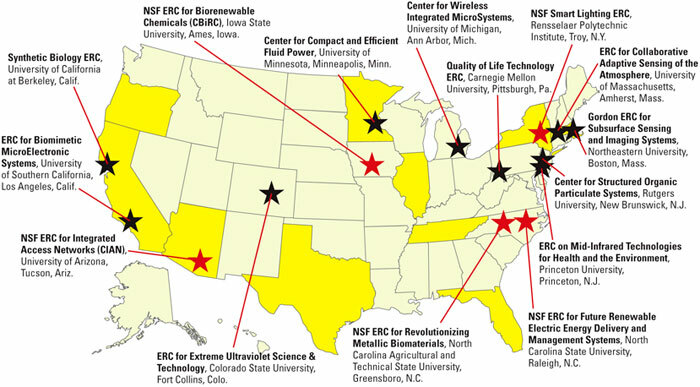 NSF will invest approximately $92.5 million in the centers over the next five years. The ERC program has been in existence since 1985. Though most ERCs involve multiple institutions, all existing ERC lead institutions are shown on the map, with the new centers highlighted in red. A worker checks shipping labels for rods at Ternium Hylsa's existing plant near Monterrey, Mexico. rgentine-Italian steel and engineering group Techint is investing heavily in Mexico. In September it revealed that its flat steel maker Ternium would invest US$4.2 billion in a flat-rolled mini mill near Monterrey, in Nuevo Leon. Meanwhile, its steel tube division, Tenaris, will invest in a $1.6-billion expansion of its seamless steel pipe plant in the State of Veracruz, making it the largest such plant in the world, with 450,000 tons per year beginning in 2011. In addition, the group's Ternium Miner�a division will invest $1.15 billion in an iron ore and pelletizing project for the states of Michoacán, Colima and Jalisco. The Ternium investments come at the same time that the company has been attempting to work out terms with the Venezuelan government over that government's nationalization of Ternium's Sidor operations at Matanzas Industrial Park, Ciudad Guayana, in Bolivar State, earlier this year. The Monterrey plant will see its first phase operational in four years, at a cost of $2.7 billion, and will produce 2 million tons a year. 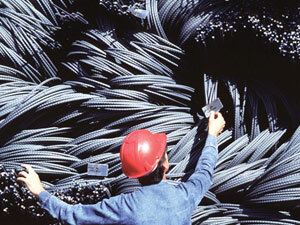 The next phase, pegged at $1.5 billion, will produce 1 million tons a year of cold rolled coils and 300,000 tons a year of hot-dipped galvanized product, and will be operational by 2013. The announcement came just a month after ArcelorMittal said it would build a $600-million carbon steel mill in Mexico, though a final site is still undetermined. It is also purchasing the Koppers coke plant in Monessen, Pa.
With principal operations in Argentina and Mexico, Ternium employs more than 18,000 people, has annual sales of approximately $10 billion and ships approximately 8 million tons of steel products each year. Until now, Ternium has conducted operations through facilities located in the Mexican cities of Monterrey, Apodaca and Puebla, and sourced all of the iron ore used in its Mexican facilities from its mines located in Colima and Michoacán. The company said it "believes that demand for value-added flat steel products in Mexico will grow steadily in the medium term, driven by new construction and industrial development." According to a Bloomberg report on Mexico's Iron & Steel Chamber of Commerce, the steel industry is expected to grow by 4.2 percent a year through 2013, supporting everything from port and airport expansions to other large industrial plant projects.